When I first heard the news of Amy Winehouse’s untimely death I immediately thought of lungs. Then I thought of heart. I felt like this was a tragic event of some kind and not an overdose. I just had this overwhelming feeling of tragedy and sadness which is hard to explain, because although I like — no, love her music — I am not the type to be affected by celebrity deaths on an emotional level and I don’t follow Amy in the tabloids or anything like that. She hasn’t released anything in a long time. So….this was highly unusual. It’s made even stranger for me when out of the blue just last week I thought to myself, I need to listen to some Amy Winehouse…I need to add her songs to my song collection I have on my iPod. Then she died yesterday and I was getting all of these weird intuitions or gut feelings about her death. My gut feeling is this wasn’t an OD, but some medical problem that just hit her. When I felt this I had no idea about her health history, except that she did drugs. I had heard that like everyone else had, which makes it more unusual that I felt immediately it wasn’t an OD. Later yesterday, I found out she did have lung problems, so I do wonder if my gut feeling is right. I don’t know about the heart. I haven’t heard about that in her history. I do know my gut feeling is very illogical given her prior history with drug abuse, that’s why I have to write about it, because it makes no sense why I’d think this. I don’t care if I’m wrong, I had to write what I felt because it was so visceral and unusual, since I don’t know this person and since it flew in the face of the obvious. I felt it was some tragic mistake, like it wasn’t a massive amount of drugs….it was something else. This part is my gut feeling. The next part will be only what I see in astrology and I’m trying so hard to separate my gut feeling from the astrology…. On the radio and on Facebook, I’ve heard some people say she doesn’t deserve to be in the 27 club with the likes of Morrison, Joplin, Cobain, and Hendrix . I disagree. She paved the way for the likes of Adele, Lady Gaga and a few other similar styled female vocalists and they even acknowledge her for that. That makes her significant in music, not to mention her talent, that unfortunately wasn’t as prolific as it could have been. Even if she didn’t have the amazing voice, she was a great songwriter. But she did have the great voice and unique style that broke the barrier for other female artists who weren’t pop tarts, and actually have real talent and real presence, and not some manufactured sound and image. That makes her fit to be in the 27 Club. The very first thing I noticed was the reverse nodal return. This happens to everyone around twenty seven years of age and is a generally difficult time that is very karmic. It doesn’t always mean death. What the reverse nodal return does is bring the past decisions (south node) to the current life path (North node). If the decisions a person has made up to this point have been good, for lack of a better word, then the reverse nodal return will run much smoother than if they made bad decisions. If good decisions were made in the past nine years since the regular nodal return it will not be as difficult. Amy made bad decisions in the nine years since her nodal return when she decided to abuse drugs. This drug abuse caught up with her at her reverse nodal return. The nodes are very karmic and even though they’re the moon’s nodes, they act like saturn and will punish or reward according to the karmic path a person is on, which includes decisions and actions made in the past nine years. Whatever happens with either of the nodal returns is not only karmic, but a person’s destiny. It is meant to be. Amy’s reverse nodal return is in her 1st and 7th houses, with the SN in her first house of health. This nodal axis is making a T-Square out of her Sun-mercury conjunction in virgo in her 5th house opposite her neptune in the 7th house. This is tense energy. The outlet of the t-square is her sun-mercury conjunction in the 5th house, which rules the heart. The sun also rules the heart. With mercury part of this her lungs could have been the cause of death (cod) as could the heart. Mercury rules lungs. It also rules the brain and mind, so it could point to something along those lines, like a stroke or something. My thought was lungs and heart, which is supported by the chart and transits and will show up again in my reading. Mercury rules her AC (health) and her 5th house (heart). I’d be remiss if I didn’t mention that the 5th house is also the house of alcohol and drugs as is the 12th. 5th house rules partying and entertainment, so it’s possible she OD’d from the chart, which affected her heart, lungs, and brain. I don’t feel that’s what happened, but it is possible with her natal and transits. It’s also possible that her prior drug and alcohol abuse destroyed her heart and lungs and contributed to her death indirectly. The sun rules her 4th house, which in addition to being a health house is the house of our death. It shows the events surrounding our death. For her, the sun in the 5th points to the heart, but it also has mercury in their burning up the sun, so lungs is possible and her lung malfunction could’ve caused her heart to stop or vice versa. The second thing I noticed was the eclipse point from June 15th being hit by t. mars. I wrote about this in my column recently and warned that the eclipse was being activated this week for people who had planets hit by this eclipse. For Amy, her neptune was hit and the eclipse squared her sun-mercury conjunction in the 5th house. The square from an eclipse is a tough one. The conjunction is the second toughest, with the opposition being the least powerful of the three aspects. When t.mars gets close to the same degree as the eclipse point, it activates the eclipse. The aspects of mars that activate the eclipse point are: conjunction, square and opposition. This one was the opposition (22 gemini). It also conjuncted her NN making it even more potent. The eclipse, therefore, conjuncted her NN affecting her life path and destiny. The transit of mars also made a t-square from her AC to neptune with the outlet in her 5th house sun-mercury conjunction. The outlet is usually either the outcome or the action taken as a result of the t-square. Without knowing what actions Amy took, that is, if she did drugs that day or drank a lot, it’s hard to say which it was, but from what I do know — she died — the outcome is definitely present. It’s her 5th house of heart and the lungs are there in the form of mercury. Drugs or alcohol can’t be ruled out and she did have the eclipse on her neptune, which rules drugs, but also rules the lungs. Lungs fits my feeling, but I’m putting drugs out there since it is possible with the chart. What’s really interesting is the degree of mars is the same degree as her sun/merc in the 5th. It’s right between the two of them by orb, so it activated the eclipse and hit her sun/merc exact. T. Mars is opposite n. neptune and this aspect can point to drug taking, but it can also point to irrational feelings that can cause violence towards others or even towards the self i.e., suicide. Mars in aspect to the node is sometimes fatal. It is a danger aspect that can herald an accident or illness. She also had the June 1st eclipse in her 1st house and the July 1st eclipse in her 1st house. Eclipses to the first house often herald health problems and illnesses. If I had been her astrologer, seeing these eclipses and the transits, I would’ve urged her to look after her health very carefully. Mars rules her 12th house of drugs and alcohol, illness, especially hidden illness, mental illness, self-undoing and secret enemies. Since it’s on her NN-AC with ruler, mercury in the 5th squared by it (mars) and ruling 5th (mercury) any of these house indicators are involved in her death. With T.Mars on her NN and in her first I wonder if she decided to stop drinking or cut down drastically. Mars-first transit is an assertive and stubborn placement. I looked back and she did have t. mars on her NN the other times she quit substances and went to rehab, so I wonder….If she stopped alcohol completely or even drastically cut down for any reason it could be deadly. Alcohol is a substance you need supervised detox for because the withdrawal can kill you. This could fit in with the heart problems. She may have even gotten sick and couldn’t drink her usual amount. Mars-first can indicate illness, especially fevers. Or she could’ve run out of alcohol or been injured so that she was unable to drink. It’s just a thought and it would fit in with the feeling of tragedy I felt, like this was something other than drug abuse and cruel irony. She has t. saturn in her 5th house of her heart also. Saturn rules her 8th house of death and is posited in her 6th house of health. This could indicate a known or unknown heart abnormality or rhythm disturbance. t.Pluto is on the cusp of her 8th house of death. A planet on the cusp of a house is at its most potent. T. sun was square her n. saturn (ruler of her house of death) in her 6th house of health. Sun rules her 4th house of circumstances surrounding her death and also the heart. (I feel like I’m a broken record with all the heart transits and lung transits!) It’s also separating from a square to pluto in her 6th house. Pluto in the 6th gives someone major recuperative abilities in health. They are able to live death defying illnesses, which Amy did in the past. Maybe the sun squaring her n. pluto made this impossible this time because for whatever reason her heart gave out (sun square pluto). There are even natal indicators in the chart that indicate this will be her cause of death: Sun (ruler of 4th house, heart) combust mercury (lungs) in the 5th square to neptune (drugs). Whether drugs actively caused her death or not they contributed to her health problems at the end. She had lung problems because of drugs and if she had a heart issue it was probably weakened by drugs over the years. It’s all there in her natal. She had been hit by so many transits in the past years that I can see why she turned to drugs if she was already inclined to do so. She had t. pluto conjunct her moon for many years, since it was in sagittarius. T. Pluto conjunct moon is one of the most difficult and harrowing transits one can have. I know, because I had it. I didn’t turn to substances to get me through it but many do with disastrous results. It kept hitting her moon because of the long length of the transit, which includes rx’s so it will hit it and them sometimes move away only to come back and hit it again. It moved on for her recently. It was finally out of orb after many years, but it turned rx again and is now in orb of her moon again. The final pass is usually the hardest because you’re beaten down by what you endured through all the other passes. Sadly, after this pass it would have moved on completely forever. It’s on her progressed moon within one degree, though. She recently had a progressed moon return which is a pivotal point in a person’s life. Basically, her emotions were being obliterated by pluto. She must have been one intensely emotional woman in the past six years or so. Pluto moved into orb of her moon in 2005 but was wide, it was when her self worth issues and depression began to culminate, I bet. Moon rules her 2nd house of self worth and also of actual possessions and money. I’m betting this is when she started making money from her music. It was also when her sense of self got lost and self worth plummeted. I don’t know this for certain because I don’t know her, but the transit would suggest this. I would think this is the time period all her problems started. Back to now….she had t. uranus squaring her moon so it was being hit heavy. First t. Pluto then uranus. Uranus rules her 10th house and was squaring her moon in the 7th-8th, which makes me wonder if she wanted to quit being a star. Maybe she wanted to get back to her roots and not be famous anymore –at least not right now. It lo0ks like she may have felt pressured into it by friends and handlers (ura/11th) and family (moon/4th). Moon rules her 2nd and 3rd so a change of mind (3rd) of what she wanted (moon/8th) looks possible. Her values may have changed and she wanted out of the business or at least didn’t want to be as big as she had become in the past. Money and people close to her may have objected to this. She was an asset to others. The uranus in the 11th square to her moon in the 8th may mean she was ready to break free. Maybe she felt used and needed a break from being a performer. I can hear the people around her now if she said this: “What do you mean you don’t want to be a star. Honey, that’s your job.” The mars in the first shows she would have the guts to do it now too. She may have even told someone this recently — t. merc on her n. venus which rules her 6th house of her job. She was also likely feeling hard done by some friends and other people in her life, but was trying to heal from it (Neptune sextile moon). She was unhappy at the time of her death, suffering from self worth issues and depression. For this and the 3rd house issues I can see the possibility of suicide, but I don’t think this is what happened. It isn’t the focal part in the chart and transits. I think she was probably leaving a lot of friends and people behind, quite suddenly (ura/11th) but for her it had been a long time coming. She was in the dark night of the soul and in a quest for a new life and enlightenment which fits with the positive qualities of her natal moon conjunct neptune. Her friends and the people around her were her enemies — 11th ruler in the 7th conjunct neptune. They were vampires emotionally to her. She had neptune in the 7th which shows picking partners and friends that deceive, are addicts and losers that brought her down and used her. Maybe she was finally beginning to realize this and doing something about it. I do feel like she had a lot of emotional pain and emptiness at the end. She was feeling everything she tried to suppress with drugs. She needed therapy badly to get all of that out, but I get the feeling Amy didn’t buy into therapy. She was a virgo and probably found it hokey. That’s probably the reason she disliked rehab and wrote that song, Rehab. She felt she could handle it on her own. It’s a shame because I could see things looking up for her astrologically in a year or so. Pluto would be off her moon for good and she would have her saturn return in the 6th house — this is when she would have been able to get her health together if she had any inclination to do so. She has her 11th house of fame on 9 pisces. 9 Pisces is the “body in the ditch degree.” I hope this doesn’t mean she’s remembered more for her death than her music. It also shows how her fame may have contributed to her death. If she had never been famous maybe she never would have been an addict. She does have POF on this same point so she may be bigger in death than in life, a legend. I don’t see this yet and I am not convinced POF is positive like it’s said to be. I actually have seen the opposite in my studies. 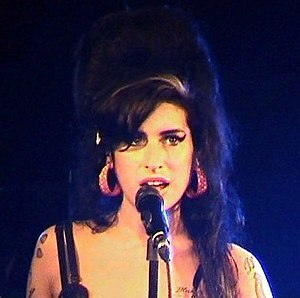 I hope Amy is remembered for her talent. She may be paid tribute when the November eclipse is opposite her chiron and conjunct her Jupiter/Uranus in her 6th. She may be honored for her body of work (6th house/10th house). Jupiter rules her 7th and 11th and uranus rules her MC (career/public image). Something will happen with that eclipse for her. I hope it’s positive. In December, another eclipse will be right on her AC so it looks like she will be “revived” in some way in the late fall or winter. In summary, I don’t see major indications she OD’d. I feel she didn’t take a large amount of drugs — it’s a combo of feeling it and lacking a glaring presence of it in the transits. Although, the eclipse was on her Neptune activating the natal death pattern so it’s possible. This eclipse to her neptune, ruler of her 11th — house of friends, others and fame could have made her decide she wanted to break free from all of that. I think she wanted to break free from people she felt were bringing her down and stop being a star and wanted a new start. I don’t think she wanted to end her life, but I have to admit it’s a possibility in the astrology, because I can definitely see depression and self-worth issues very prevalent right now. That’s also a reason to take drugs though, too. Cause of death is pretty obviously heart or lung issues, but manner of death is what is unknown right now. What I can see as possible scenarios in the charts: Undiagnosed illness, withdrawal for whatever reason, OD, suicide. I do think the eclipse was the catalyst for her death. It’s what stands out the most next to the reverse nodal return. I still feel like something weird happened here…astrology aside. RIP, Amy. Your music will live forever. This entry was posted in Celebrities and tagged Amy Winehouse astrology. Bookmark the permalink.